Tongariro National Park is an associative cultural landscape of active volcanic mountains that hold a number of Maori religious sites. It is situated on the North Island of New Zealand. Tongariro National Park was the fourth National Park established in the world. 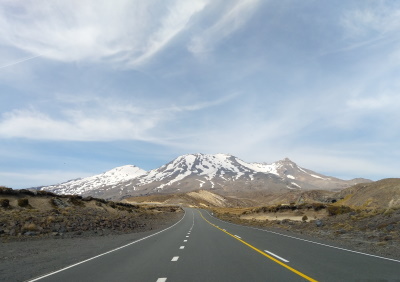 The active volcanic mountains Ruapehu, Ngauruhoe, and Tongariro are located in the centre of the park. The mountain summits are of great significance for the cultural identity of the local Maori people. 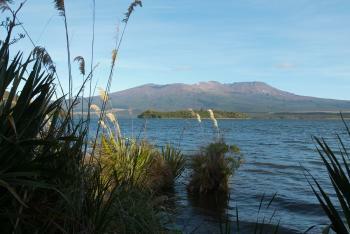 I visited Tongariro National Park in 2007. It is a lovely park situated in the center of the North Island of New Zealand. Tongariro is best known in popular culture as the real life location of Mount Doom from the Lord of the Rings Movies. Getting here is easy to do by car and there are many tours and trekking options inside the park. Read more about Tongariro National Park on my website. From the moment you walk along the rise and see the volcanic plain stretching across to the mountains it becomes clear: this is Mordor. It's not surprising, then, that Peter Jackson filmed scenes from The Lord of the Rings in Tongariro National Park. I hiked the Tongariro Alpine Crossing in 2010, and it was the best hike I did in New Zealand and was a fantastic way to see the park. From the eastern side of the trail, the lower stretches follow a stream through woodlands, but the vegetation soon disappears giving great views of the forests below and fumaroles steaming off the side of the mountain. 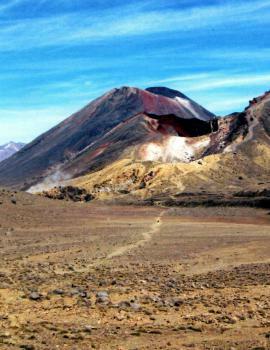 Upon reaching the summit, hikers cross a volcanic plain dominated by Mount Tongariro and Mount Ngauruhoe, which are still active. The climb up the saddle of Mount Tongariro, the highest point of the trail, rewarded me with an incredible vista across the North Island. The Tongariro Crossing is a one day hike I highly recommend if you want to get a good feel for the park. Just be sure to bring plenty of water! Logistics: The hike is best done with either a car at each end of the trail or by arranging a taxi or shuttle to drop and/or pick you up. There are three snow capped peaks within the national park, all of which are active volcanoes. I have witnessed on several occasions smoke, ash and lava spewing from various vents on the mountains, particularly Mt.Ngauruhoe. The crater lake on the summit of Mount Ruapehu periodically overflows, tipping its contents of hot water down its slopes. Despite these hazards, in the summer the mountains are used by trampers following the various trails marked out on the landscape. In the winter it is a mecca for ski fanatics, with chair lifts and rope tows heading off in all directions. The most magnificent sight was an early morning - snow covered Ngauruhoe volcanoe on pink sky. I will never forget it. In general - incredible mix of fierce wilderness, unusual beauty and hospitality of local people. If you are lucky enough to visit the site - try at least the track named Tongariro Crossing (consult tourism bureau before - often weather up there is too dangerous). It takes rather weary day, but it is incredible to walk so quickly from forests through tussock above snow line and back. Middle Pleistocene: In geological terms, the landforms of Tongariro National Park are comparatively young. These volcanoes are all less than 500,000 years old and still active.